The opening of the new Faculty of Law building on the North-West University’s (NWU’s) campus in Mahikeng confirms the university’s commitment to produce future leaders and game changers. The faculty on this campus currently has 939 undergraduate students, 75 postgraduate students and 28 academic staff members. “This building is a symbol and living testimony of real integration and functioning as a unitary faculty,” says Prof De la Harpe. He said that social justice is not only the government’s responsibility, but that everyone needs to choose to be an activist of social justice in their own social space. “What is it we can do, based on our Constitution, to confront the social ills in the country? Intellectuals must find solutions on how the previously excluded individuals can begin to participate meaningfully in the economy of the country,” he added. Judging by the quality of its alumni which includes various Constitutional Court judges, the faculty is playing an important role in the development of law in South Africa. 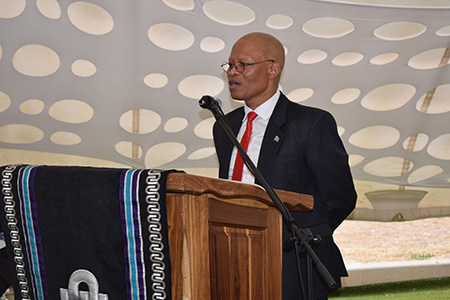 Chief Justice Mogoeng Mogoeng delivers the keynote address during the opening of the new Faculty of Law building at the NWU’s campus in Mahikeng.